I love where I live; since moving to our new home four years ago, I've been able to build a relationship with a piece of land for the first time since I was a child. It's everything a dirt-worshipping Pagan could ask for. I have a garden, and I grow much of my own food, and that is as much a spiritual delight as a taste treat. And I have woods again as neighbors: glacial boulders, white pines and black birches, owls and white-tailed deer. And the bears eat my lettuce. This picture has been Photoshopped. This is not real! I'm not kidding about that. Oh, it's winter now, and the bears are huddled up in their dens. But this past spring, I grew lettuce. Award winning, gorgeous lettuce: three different kinds! They were nourished to extraordinary size and succulence by the cool, wet weather we had, and each night, I would gather just a few outer leaves, knowing that careful tending would mean tasty salads for months. And then, over the course of three days, the bears ate every single one of my lettuce plants. It was the adolescent bear cubs that raided the garden. Our next-door neighbor caught them in the act; a whole bear family spent the spring and early summer walking through our yard as calmly as though it were a public park, just for bears. There was the mama bear, the two no-longer-baby bears, and, hulking through the woods nearby, a brand new papa bear. Our next-door neighbor's theory was that the new papa bear was ready to push those teenagers out of the den, to make room for him to have a little alone time with their mama. And the teenaged bears were hungry. I can attest to that. Though I never saw them raiding my garden, I did see them passing through, and those cubs looked like puppets, like unconvincing bear puppets, with fur draped over sticks as they stilted across the yard. There was no plumpness to them at all. It had been wet, you see, and cold. And the berries were slow to come. And probably those are the perfect conditions for tempting adolescent bears into a lettuce patch. Still, my compassion was limited by my sense of impending loss. 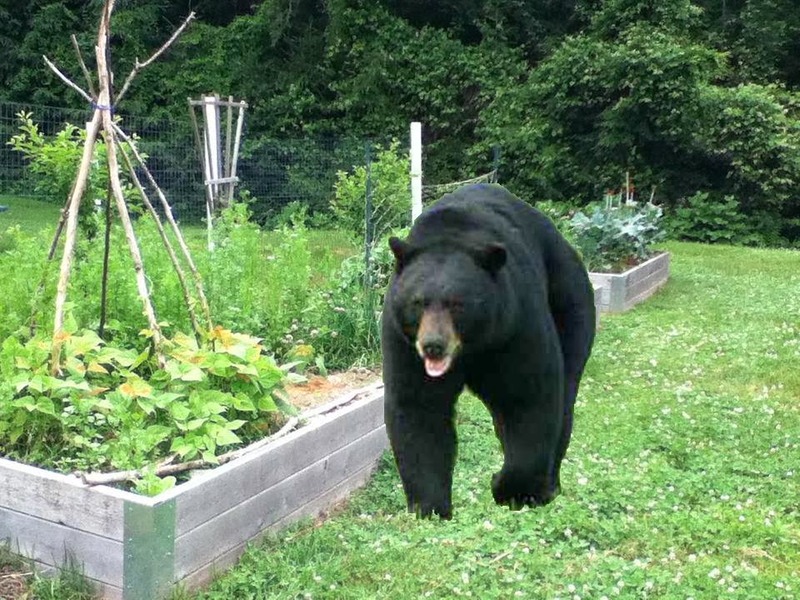 Would lettuce-eating bears mean I had to let go of keeping a garden at all? Deer raiding a garden are a nuisance, and can wipe out an entire crop. But deer can't take a bite out of you, and maim you or even kill you. If bears decide that something in your yard is an all-you-can-eat buffet, what can you do? There's not really any such thing as "bear proof," and we all know that bears can be dangerous. We all know, for instance, what happens if we get between a mother bear and her cubs. It looked as though the only thing to do might be to shut my garden down. I hated that thought. And for about a month, I hated those bears. We tried everything: cayenne pepper and garlic powder, pie pans suspended over the garden to hopefully frighten the bears away. Nothing worked. Except for running out of lettuce; they left everything else alone, and seemed to go away. And I went from panic-stricken to complacent, writing it off as a fluke. Until fall, when I planted another crop of lettuce. And--yeah, that's right. The damn bears came back and ate all my fall crop of lettuce, too! I remember the night I came outside to harvest lettuce for our dinner salad. It was early October, and already beginning to get dark, so I didn't immediately see it: all our lovely lettuce, chewed to stumps. I stormed. I raged. I shouted to the woods words that young children should never hear, and I waved around my paring knife, brought out to cut herbs for the salad, and threatened any bear fool enough to approach me with immediate death and destruction. For those few moments, I was utterly convinced that no bear--not the cubs, not the mama, and not even the 600 pound papa--would dare defy my rage and enter the garden that night. I was, for the sake of a half-dozen heads of Romaine, ready to do battle with an animal many times my size, and I was quite, quite sure, that I would be the winner through sheer force of will. Actually, I was probably right. It turns out that a lot of what we humans "know" about bears is not true of black bears, the species that I share my woods (and my lettuce) with. A black bear mother, for instance, is much more likely to flee from a human than defend her cubs. All black bears are more likely to flee from humans than confront us; their evolutionary history is entirely different from that of the grizzly bear, the source of many of the things we falsely believe to be true. And while I am not actually fool enough to want to enter a confrontation with a bear of any size, in point of fact, the black bears of New England don't want a piece of this action, either. Even when I'm not enraged and waving a kitchen knife. I know this because I finally got motivated to research black bears. My initial response had been fear, and anger, but it turns out that if you follow the science and not the legend, there's no more reason for the one than the other. Since this fall, I've discovered a wonderful research center in the Midwest that focuses on what my black bear neighbors are really like. I can't say enough good things about them--the North American Bear Center, in case you're interested--and I'm happy to say that I've become a supporting member of their center. I'm happier still to say that, as I get to know what the bears in the woods are really like, I'm much more comfortable with the fact that I share my home with them. (There's a reason they used to call this part of town Bear Hill, I suppose.) And I get to keep my garden. Even if bears do come calling, they are much less terrifying than I'd initially supposed. However, I'm not going to share my lettuce with them this year. I'm going to plant kale. Beautiful, Cat. I love the way you "Walhydra" your way through this story, in order to teach yourself something. Only additional comment: Maybe your planting lettuce is like my putting out corn, sunflower seeds and peanuts for the squirrels to keep them away from the bird feeder. It doesn't work, but they enjoy the squirrel food. Wonderful, Cat! Such a pleasant surprise to find this. We share our land with the bears too, among other critters (saw a fisher cat twice last month. Thankfully the chickens were locked up). A couple of years ago we watched as a mother showed her cubs how to take down a bird feeder. Unfortunately it was OUR bird feeder. With a mangled pole and litter of seed on the ground, the mother sat on our porch step watching her kids eat. Got to love the woodlands! Maria, I had some of the same feelings myself this past summer, and I'm really happy that I can let them go. I was originally so glad to have bears as neighbors, and I have felt a little bit ashamed of how "un-Pagan" my feelings toward them became once they became regular visitors to my yard. They may still wind up raiding my lettuce. Maybe this year, they'll even develop a taste for kale (though I sure hope NOT). But knowing that even if they do, it's not a major danger to me shifts my attitude a lot. Michael, if I leave out lettuce for them this year? I'm going to put it in the woods. If nothing else, they are clumsy visitors to my salad bar. And Laura, what a story! I admit, I am envious of your actually seeing a fisher cat--though I've pretty much given up on the thought of chickens, just considering our friendly neighborhood bears.